Near Geraldton. Head north from Geraldton for about 40Km to Northampton. Just after reaching the town, make a left turn to Horrocks beach. Take another left turn, shortly after. After about 20km, on the last rise before you head down to Horrocks itself, make a right turn on to a limestone track. This extends about 8Km then makes a left turn which stops at the take off site. There is no problem with parking. Its a case of find your own spot in the bush. You may want to camp at the site with no facilities, but Horrocks itself is only a short distance away and has a caravan park and other accomodation. Excellent big coastal site north of Geraldton. Horrocks has a ridge that runs for more than 15km north and on the right day this an excellent site, but like all ridges you have to be aware that if the direction is slightly off, you may not get back to where you started. If the wind drops you will find yourself scratching. The beach landing is plentiful near takeoff and although very bushy in places is not short of top landing spots which beats climbing back up the ridge. 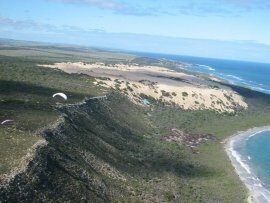 The beach is accessible by 4WD from Horrocks town, a long way round, but may be useful for hanggliders if they bomb out. Several kilometres north are some sections with no bottom landings. At the north end of the ridge is the town of Port Gregory, but in between there are no roads nearby. Good safe coastal ridge. 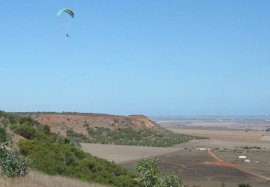 If wind is S there can be turbulence behind the peninsula on to the left of or on the take off area, a safer launch can be found in these conditions by walking north along the cliff tops, but it would probably be better to go and fly Mt Rennie. In a NW wind you can fly the sand dunes south of launch. The long main ridge is best in a SW wind. 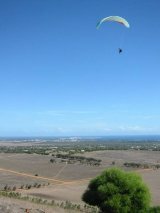 The ridge shape produces plenty of lift and can be soarable with as little as 6 knots of wind on take off. 130km N of Geraldton. Just North of Kalbarri are flyable sand dunes. To get there you need to cross the Murchison River Mouth. There is a boat service which can ferry you across from town. There is a bell on the North side that can be rung to be fetched. There are no facilities on the north side of the river. Very Long coastal site rising from Dunes to Sea Cliffs. The start north of Kalbarri is a typical sand dune site. The ridge rises as you head north, carrying on for over 100km and becoming the Zuytdorp cliffs, sheer vertical cliffs into the ocean. Obviously the cliff section is not suitable for novices. There is very limited road access between Kalbarri and Shark Bay, expected to have to walk all the way back to Kalbarri if the wind changes. The cliffs have been flown from the north end near Useless Loop, but the launches are very committing with no bottom landing, and reputedly many sea monsters. 120km N of Geraldton. 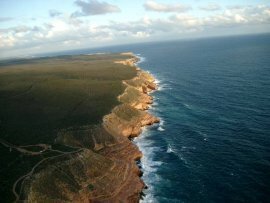 Head south from Kalbarri, Red Bluff is the first area, and there are several other signposted scenic lookouts further south. Big coastal cliffs with no bottom landings. Red Bluff offers some bottom landing options but still has a cliff at the final section into water. Other areas have little or no bottom landing, so must only be flown when height can be maintained for top landing. 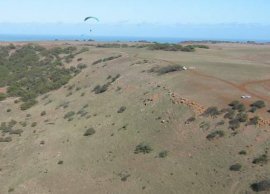 There is a small north easterly ridge at Red Bluff which is just flyable in the right wind, but with danger of going down the seacliffs if blown back. Small site just inland from Port Gregory with accomodation. The site is inland but very close to the coast, so almost a coastal site. Large grassy takeoff and landing areas. There is a possiblity of thermal activity and associated turbulence. It is possible to fly here from Horrocks on the right day. Near Geraldton. The site is on Chapman Road about 5km out of Geraldton, opposite Wozzas Knob. Also known as City View as it overlooks Geraldton. If you haven't been here before, contact a club, check on the current access arrangements, and preferably organise your first flight with a club member who has good knowledge of this site. This site is privately owned, so is sensitive and could easily be lost. Contact local pilots in Geraldton before heading up there to get an update on current access situation. Top and bottom landings. 500ft height restriction applies. Site is directly under landing approach for airport. There is a droppable section of the wire fence at launch to facilitate safe launching and landing. Despite proximity to the coast this is an inland site subject to thermal turbulence, and needs to be respected. XC record is over 100km to Moora. Near Geraldton. Entry via farm. All pilots must sign the disclaimer in the farmhouse and the the first pilot there and the last to leave each day must drop into the farm and let them know what's happening. The site is about 17km NE of the Chapman Rd turnoff from Geraldton. Nice southerly site near town, flyable on the seabreeze. If you haven't been here before, contact Cloudbase Paragliding Club, check on the current access arrangements, and preferably organise your first flight with a club member who has good knowledge of this site. This site is privately owned, so is sensitive and could easily be lost. Contact local pilots in Geraldton before heading up there to get an update on current access situation. Difficult take off for paragliders due to the shape of the hill which tends to create a very stong wind right at launch in soarable conditions, but less wind on the face starting well back from the edge makes the inflation easier. Bottom landing is best near the road up the hill, to the right of take off. XC record is only 20km or so. Nice view of the "mushroom farm" spy base if you get some height. Geraldton. The site is on Chapman Road about 5km out of Geraldton. There are two gates opposite each other. The one on the left has a box just inside the gate and leads to the NE and SE sites. The one on the right has a box, two gates in and leads to the westerly site. The book inside the box is for your name, HGFA number and date. You must register to fly this site. 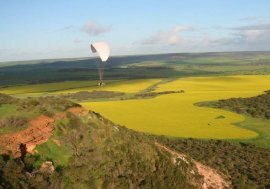 Good ridge soaring site near Geraldton. 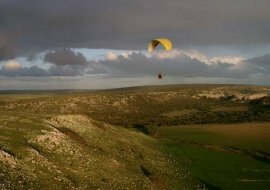 If you haven't been here before, contact Cloudbase Paragliding Club or Hillflyers Club. Check on the current access arrangements, and preferably organise your first flight with a club member who has good knowledge of this site. This site is privately owned, so is sensitive and could easily be lost. Contact local pilots in Geraldton before heading up there to get an update on current access situation. There is no problem with parking for lots of cars. No camping. Take care at these sites with the conditions. The SE site is potentially dangerous in high wind. The back of the ridge is not that far away and if you do not have enough height you will have rotor to deal with. The potential for gusty thermals is high. Be in touch with the conditions. All these sites are good for sleddies and new top landings. 500ft-height restriction applies. Site is directly under landing approach for Geraldton airport. Ridge drops steeply behind in places - large rotor.